MainAll NewsDefense/SecurityWhich ministers support cease-fire with Hamas? 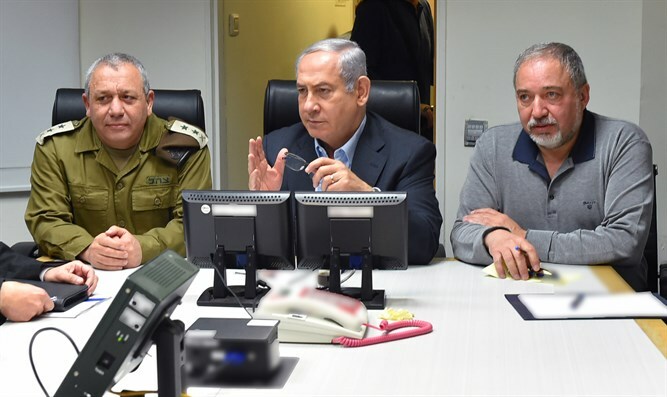 Which ministers support cease-fire with Hamas? Defense Minister denies reports he and all Cabinet ministers support cease-fire agreement after over 400 rockets fired at Israel. According to reports on Tuesday evening in the Israeli media, all the cabinet ministers, including those who present a hawkish line, such as Defense Minister Avigdor Liberman, Education Minister Naftali Bennett and Security Minister Shaked, supported the decision to stop the retalitory strikes in Gaza and reach a ceasefire with the Hamas terrorist organization. However, shortly after the report, the office of Defense Minister Liberman issued an unusual statement denying these reports. "The briefings about Defense Minister Avigdor Liberman's alleged support for stopping the attacks in Gaza are pike news," the defense ministry said. Shortly after the meeting, the Arab television network Al-Jazeera reported that an agreement had been reached between Israel and Hamas on a cease-fire in the Gaza Strip. The agreement was reportedly obtained by Egyptian mediation. According to the latest figures published by the IDF, about 460 rocket and mortar launches have been identified from the Gaza Strip since Monday afternoon.